The Infocomm Media Development Authority (IMDA) strives to develop a vibrant, world-class infocomm media sector that drives the economy, connects people, bonds communities and powers Singapore's Smart Nation vision. IMDA does this by developing talent, strengthening business capabilities, and enhancing Singapore's ICT and media infrastructure. IMDA also regulates the telecommunications and media sectors to safeguard consumer interests while fostering a pro-business environment. IMDA also enhances Singapore’s data protection regime through the Personal Data Protection Commission. 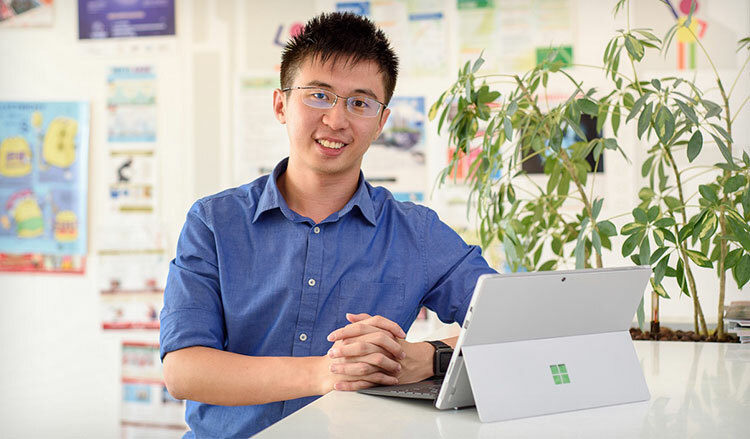 Terence Lim, recipient of the National Infocomm Scholarship (NIS), shares more about his job in Microsoft, and offer some prudent advice for those who wish to join the infocomm sector. What drew you to NIS? I have always loved technology since a young age. The pivotal point was when my teachers in Junior College (JC) recognised me for my interest in IT as well as my achievements as a Singapore computer Society IT youth leader finalist and nominated me for a partially-funded study trip by IMDA to Silicon Valley. During my 3-week tour, I visited leading IT companies and exchanged ideas with IT professionals, who inspired me to pursue a career in the sector and also to study at a university overseas. I also had the opportunity to learn about IMDA’s vision of supporting the growth of the IT industry in Singapore and the benefits of the scholarship programme, which strongly aligned with my personal aspirations. I felt that the NIS was an all-in-one package that I had to pursue. Share with us more about the roles and responsibilities of your job? My first role within Microsoft was that of a Technical Evangelist. It gave me the amazing opportunity to utilise my technical skills, and work closely with independent software vendors (ISVs), start-ups and student developer audiences to adopt Microsoft platforms. My role also involved the management of the Microsoft Student Partner (MSP) programme, the mentorship of prestigious events such as the Imagine Cup competition and execution of technical hands-on workshops. I was later presented with the opportunity to take on a new enterprise customer-facing role under the Microsoft Academy for College Hires (MACH) programme. Today, I am a Technology Solutions Professional, and my key focus is to drive Windows 10 in the enterprise space. As a result, I get to work closely with partners and enterprise customers to land new productivity, security and deployment scenarios with the new serviceability model of Windows. What are some challenges you face at work, and how have you overcome them? My work in Microsoft is extremely exciting as I get the opportunity to solve unique challenges every day and they differ with every customer. Some of these challenges in driving Windows 10 Enterprise adoption is identifying blockers and finding ways to help the customer overcome them. One of the wonderful perks of being part of a technology giant such as Microsoft is the vast amount of resources readily available. With access to the best minds and mentors around the world, I am able to leverage on the strengths of my peers and colleagues to overcome these challenges. What can aspiring NIS scholars look forward to? One of the best eye-opening experiences I had as a student at the US’ Carnegie Mellon University under the NIS programme was the opportunity to volunteer in Rwanda for three months. As an IT consultant, I had the opportunity to work closely with orphaned and vulnerable youths who suffered from the genocide, and to help them to realise their maximum potential through technology. This has inspired me to pursue my passion in technology to improve lives. It also fuelled my interest in travelling around the world and experiencing different cultures. Having benefitted from the NIS, I can say confidently that this is one of the best scholarships to take up if IT fascinates you. You will get to meet the best minds in the IT industry and receive a lot of networking opportunities, on top of pursing an IT-related education at a top-notch university.